Beware when picking up an octopus - they can bite! Photo by Christina Meschkat. Left: the three papillae beneath each eye is a key identifying feature of this species. Photo by Kate Adams. Right: photo by Christina Meschkat. 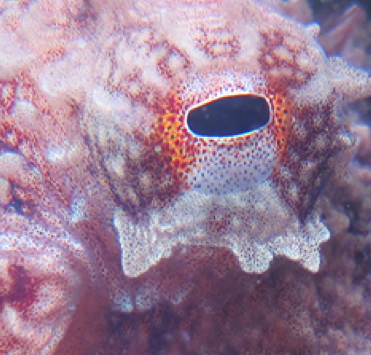 This octopus is normally red or reddish brown with white mottling, but can quickly change to yellow, brown, white, or mottled, as well as textured. Its mantle can be up to 10 cm long, with arms around 4 times the lengh of the body with a total length to about 50 cm. It is best identified by having three papillae, or flaps, underneath its eye (see the bottom left photo). This species lives in kelp forests in sandy and rocky areas, to a depth of 200 m. Its range extends from Alaska to Baja California and in the Gulf of California. The giant Pacific octopus (Enteroctopus dofleini) is similar but lacks the eye papillae and has folded skin covered in papillae. 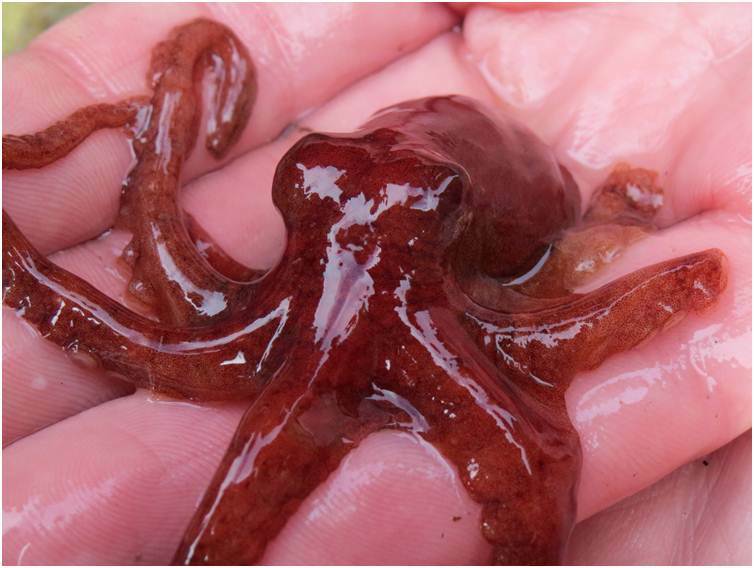 It also reaches a larger size than the Pacific red octopus. Octopuses are considered the smartest invertebrates, and potentially as intelligent as a house cat. They have excellent sight, though they use their sense of touch and smell to hunt. 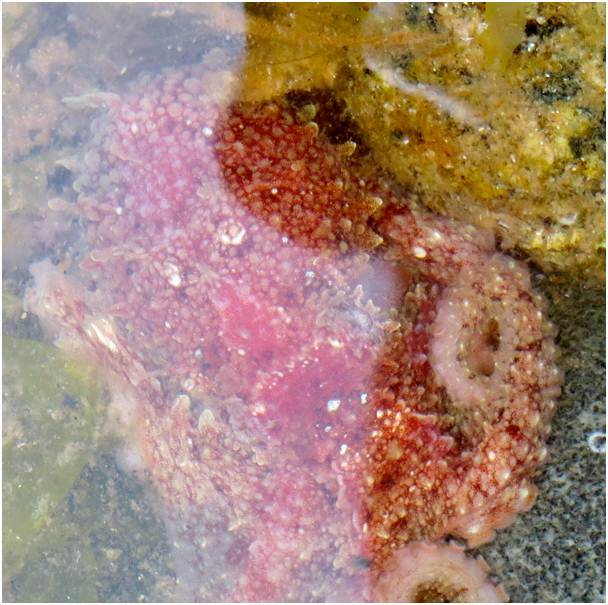 Pacific red octopuses prey on marine invertebrates (crabs and hermit crabs are favourites) and fishes. They use venom to kill prey and their sharp beak to open shells. Their radula is capable of drilling through snail shells, and they can inject a chemical to separate flesh from shell. Beware when you spot one in the intertidal zone - they have a tendency to bite (using their beak) when picked up; the venom they may spit on the bite can prolong healing to 3 weeks. Cowles, D. (2005). Octopus rubescens Berry, 1953. Invertebrates of the Salish Sea. Rosario Beach Marine Laboratory. Accessed 10/07/2014. Harbo, R. 2011. Whelks to Whales: Coastal marine life of the Pacific Northwest. Harbour Publishing: Madeira Park, BC, Canada. P. 161. Lamb, A., & Hanby, B. 2005. Marine Life of the Pacific Northwest. Harbour Publishing: Madeira Park, BC, Canada. P. 273. Red octopus. Monterey Bay Aquarium. Monterey Bay Aquarium Foundation. Accessed 10/07/2014. Christina Meschkat, Kelly Fretwell, and Brian Starzomski (2014).